9 September 2015 marks 270 years of manufacturing for the German based hoist and crane manufacturer J D Neuhaus, and after seven generations, the company is still managed by a descendant of the original owner. Load handling equipment supplied by J D Neuhaus is now utilised throughout the world, from small engineering workshops up to large organisations and including some of the heaviest and most demanding handling operations, even under extreme operating conditions. Their world market leader status is backed-up with a service and supply organisation established in more than 90 countries together with over 70 branches. Lifting equipment has been the backbone of the manufacturing dynasty, with their first wooden shaft winch being produced in 1745. Winches were also initially produced for waterway locks, controlling a growing traffic of horse-drawn barges on the Ruhr river. Business developed to include lifting and handling of railway carriages, the general loading of goods and a widespread use of JDN products in the coal mines of the German Ruhr. Over time their winches became progressively more powerful so that by the 1880’s they had the capability of moving individual loads of up to 7,500kg. Improvements in the quality of materials, coupled to an ongoing development program meant that JDN products became progressively more compact as well as providing enhanced safety and performance capacities. 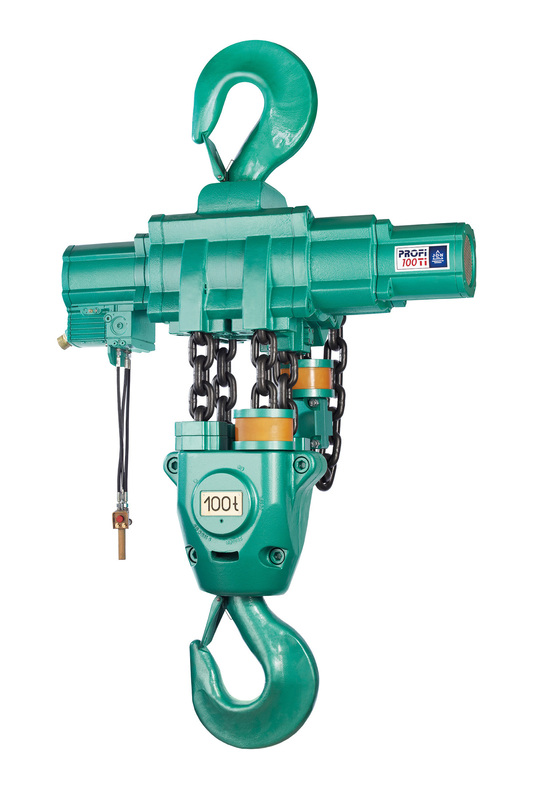 A major step was also taken by the company with the introduction in 1952 of hoists powered by compressed air, which operated a rugged vane motor encapsulated within each hoist. This proved to be a positive advance for their principal customers at that time, being the coal mining industry, enabling them to operate more effectively, with greater economy and at higher levels of safety when working underground in dust laden, explosive conditions. In 1966 the first JDN air operated hoists for applications outside underground mining were launched into the market, covering lift capacities of 250 to 1000kg. 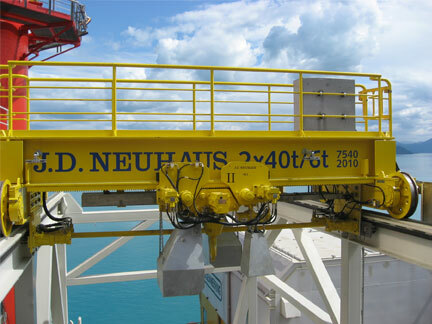 Further product developments also ensured that JDN hoists were equally successful in other potentially dangerous working conditions as typically experienced in tunnelling, foundries, the chemicals industries, cement manufacture, steelworks and shipbuilding, together with oil and gas industries both on land and offshore. In fact any industries where heavy loads and potentially dangerous working conditions and explosive atmospheres exist. Over the years the JDN product range has been developed to incorporate hoists with ever-increasing lifting capacities, providing a product range suitable for applications right across the engineering spectrum. 1979 was highlighted by the introduction of the Profi 100 TI unit, the first air hoist worldwide having a capacity of 100 tonnes. In the same year, JDN also introduced monorail hoists, specially developed for BOP handling in the offshore industry. Parallel developments also culminated with the plant construction business unit being founded in 2011. 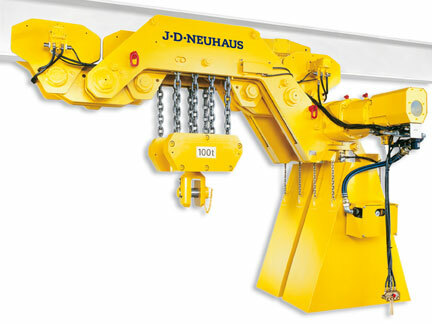 Hoists with optional power supplies of either compressed air or hydraulics are also now available in the JDN range. Most of the hoists are designed for top hook suspension, with optional trolleys also available to accommodate overhead rail mountings. Monorail hoists have also been further developed for specialised industry applications, particularly where loads have to be moved within areas of reduced space or where low headroom conditions exist. 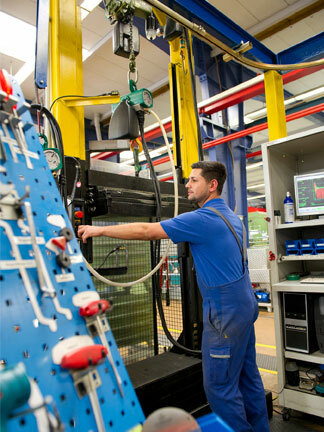 More recent product developments also include major redevelopments of some hoists in their Profi range which offer up to 50% savings in energy consumption, with increased lift/lower speeds. Appreciable reductions in hoist overall sizes, weights, and operating sound levels have also been achieved. The manufacture of special purpose hoists has also been undertaken over the years including big-bag handling units where workloads comprising powdered, granular or small component materials are involved. These hoists are often utilised with cruciform lifting beams. BOP handling systems have also been supplied suitable for both land based and offshore oil and gas exploration, including both jack-up and semi-submersible drilling platforms. Hoists have been linked together for these operations to handle individual BOP loads of up to 200 tonnes. The utilisation of JDN hoists for interesting civil construction projects includes the new Las Vegas High Roller Observation Wheel at 550 feet high. This can carry 1100 visitors in 28 suspended pods offering exciting views over the Las Vegas Strip. Air and hydraulically operated hoist products are also incorporated into the JDN crane systems which have developed into a major market for the company. The explosion-proof aspect of the equipment is a major feature of standard or special purpose overhead travelling cranes including both top and under-hung variations, as well as the JDN jib cranes. The provision of handling products for niche markets has been a growing major output for the company, to the extent that JDN promotion material now proudly states that our products are ‘engineered for extremes’ which includes an 80% of the market share being exports. Products in this category include both air and hydraulically operated hoists designed for underwater operation down to a depth of 70 metres. Oblique pulling as well as vertical lifting is provided to cover a wide range of subsea tasks. Hoist operations in arctic conditions have also been accommodated with a hydraulic unit, for operation at ambient conditions as low as -45°C. The company are geared up for forthcoming specialised markets including land-based fracking operations, and the development and construction of specialised turnkey handling systems. Quality, environmental protection, employee orientation and highly effective processes play a key role in the production and operation of Neuhaus products. The company’s environment management system was certified by the TŨV Rheinland Technical Control Association in 2009. 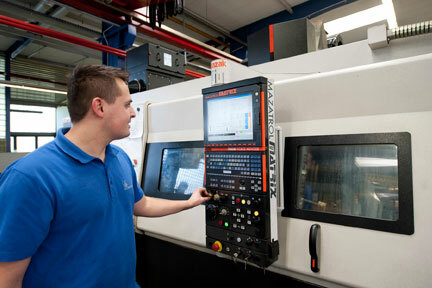 JDN has been reviewing its quality management system on a regular basis since 1991. Methods such as Kaizen, CIP, Kanban, Lean Production and ERP serve as a basis for the whole JDN Group, which achieved a Group turnover of around 50 million euros in 2014. Annual production amounts to 6,000 to 8,000 hoists. At present, J D Neuhaus employs a workforce of 215, of which 160 work at the production site in Witten, Germany.